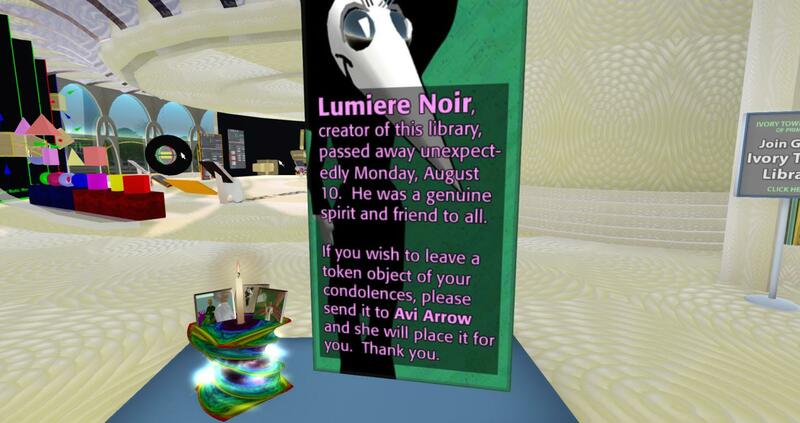 Sad news to report today is that Lumiere Noir who built the Ivory Tower of Prims in Second Life and participated in building contests in the early days of Second Life died on Monday 10th August 2015. Today we heard about the loss of our dear friend Lumiere Noir whom we have known for some years. We would like to express our deepest sorrow and sympathy for those who were close to him and wish him a good journey into the next virtual world. I hope something will be arranged in Second Life to mark his passing and he will be missed deeply. You can visit the Ivory Tower of Prims in Second Life here and revisit the building tutorials etc. A Self-Guided, Self-Paced, Comprehensive Building Tutorial. Learn how to build lessons. Some very sad news today. It seems RL has it in for Residents this year, unless we’re just hearing about them more as contacts grow between avatars. Rest well, Lumiere! This is a very sad day for SL. It was, and always will be a large part of SL history and Lumiere will hold a place in our hearts and memory. Sad news. We lose so many. The library community of SL has added so much to our virtual world. A very sad loss indeed! Jase Byrne here….the first time I saw the Ivory Tower I was gobsmacked…when I contacted Lummie, I felt like an ant approaching a god. Instead I found a kind and funny human being who encouraged me to participate. He ran some of the first build contests that I competed in, and opened his land to the first AIDS Quilt build display. Lummie was amazing..and will be missed. So sad to hear this news. The Ivory Tower is an SL landmark, and the man behind it an inspiration and so generous with his knowledge. RIP Lumiere, and condolences to your family and friends. Pingback: Lumiere Noir RIP « sweet f.a.